My name is Volker, first licensed 1994 as DG7UAF and from 1997 to 2006 as DH7UAF and still enjoying the hobby. 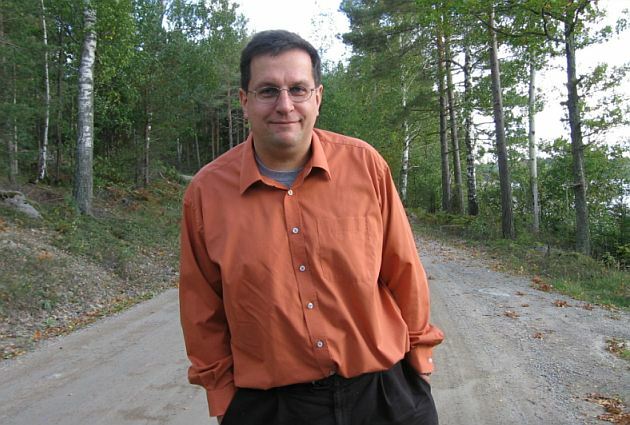 I live in Finspång which is a small town about 40 km from Norrköping in the middle of Sweden. I am married to a wonderful woman Silvia DO2SJ and two spoiled cats. I prefer exotic kinds of digimodes as MT63, MFSK and Hellschreiben. However, I am still learning CW so if you hear me please be patient as I am still learning and up to now I have had a few QSO’S on CW. I like homebrewing, repairing old tube radios, the maintenance of computers, digimodes and rag chewing with the keyboard. I can type with all ten fingers. This goes faster, much faster than CW. I like open minded hams which are interested in technical stuff. There is always something new to learn. And last but not least I like Sweden. I think it is one of the best places in the world to live. However the climate is pretty cold. You have to love snow. I am not amused about expensive dxpeditions from stupid and small islands from the middle of nowhere and the big amount of contests every weekend, because it has nothing to do with real communication and ham spirit between hams in my opinion. As a radio amateur I am neither an answering machine nor a computer. I am a human being. I don´t collect paper qsl cards. However, I prefer www.eqsl.cc, because it is smart and I don´t have to waste my time with paperwork. My working conditions here are a Yaesu FT-747GX modified by myself for the use of digimodes and DRM-reception, a homemade interface with an optocoupler and a power supply, which was a former 200 Watt PC power supply. 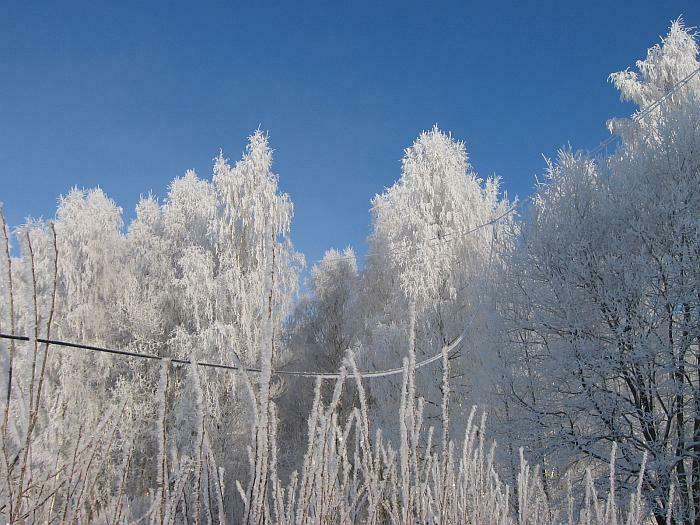 My antenna is up to now a full size multiband dipole for 80-, 40-, 20- and 15 m hanging between some birch trees. Please, no paper-qsl! I am not a member of any club. I don´t collect qsl-cards! I even don´t send qsl direct! Why? The next post office is 12 km far away. Instead, I prefer nice and friendly chats in Swedish, German or English. 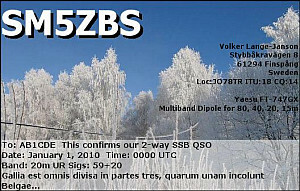 The best chance to meet me on the bands is on 40m or 80m in wintertime in MFSK16. You are welcome to make a sked with me. However, my antenna is down just now. That´s why I am qrv on skype and ooVoo, which works like a charm and you don´t need an antenna. You don´t even need to worry about interferences, bci and tvi. It just works. Cruising through my little swedish hometown Finspång: We use studded tires in wintertime. 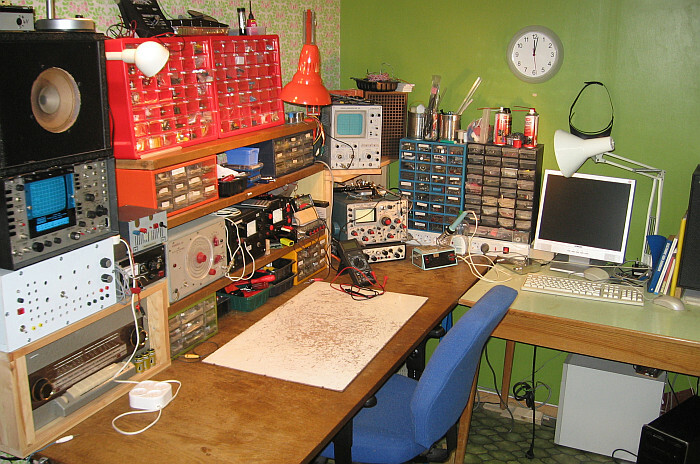 My workbench, where I spent hours during the cold and dark Swedish wintertime. In this corner I invent things the mankind don´t need, but are nice to have. In the short summer period live is different. 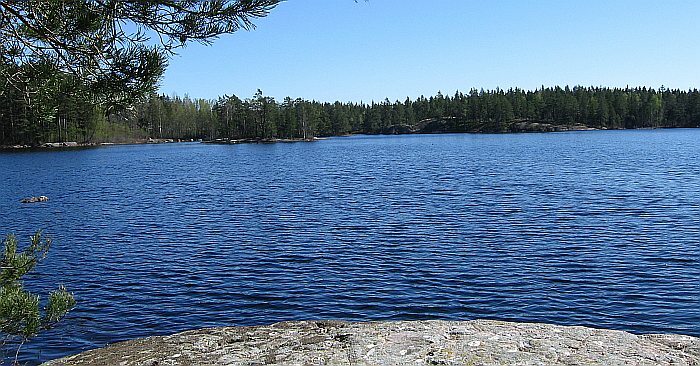 You want to stay outdoors in the nature, enjoying swimming and hiking. 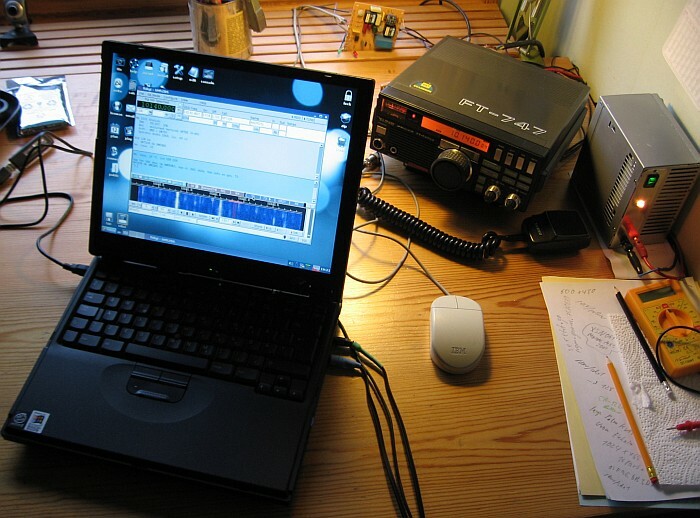 Summer time is too short for ham radio activities. My equipment for PSK31 with Linux, an old Yaesu FT-747GX and PSU modified by myself. That´s all you need for having fun. My antenna during a cold winter day. It is a full size dipole for 80m, 40m, 30m and 20m. I love old tube radios in good working conditions and other stuff from the fllea markets for almost nothing. 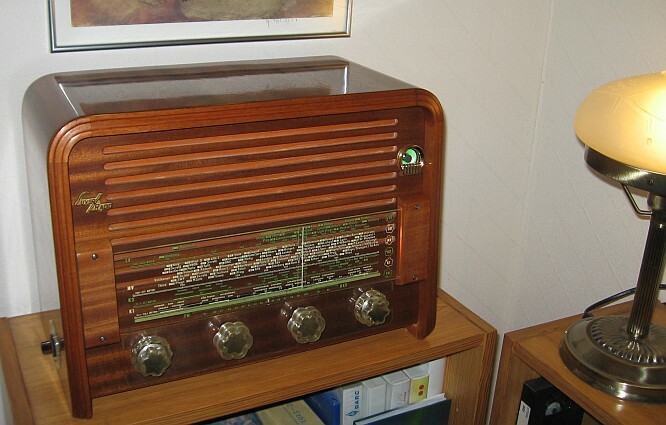 The picture above shows an old Swedish tube radio (Luxor Sopran 797W) from 1955 with FM and AM in Swedish design of this time. My new passion is collecting old smartphones, which I use in my every day live. 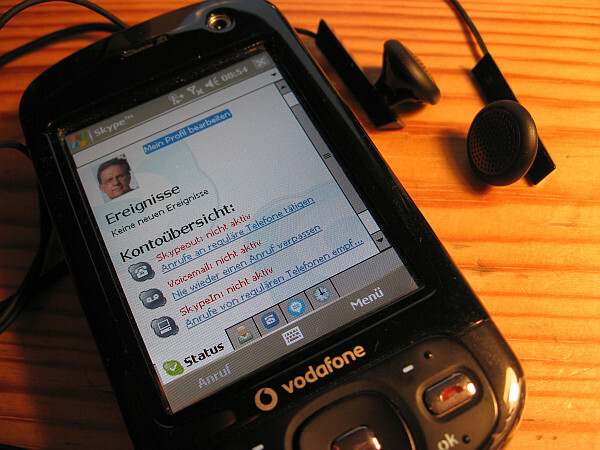 Here an HTC P3600 from 2007 running Skype Mobile. It is still working. Even Skype works.